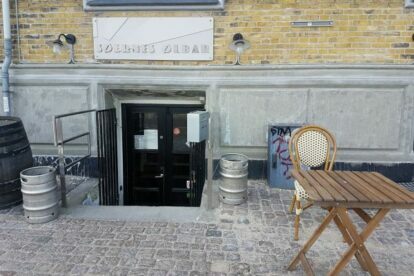 Søernes Ølbar is exactly what the name claims – a beer bar by the lakes. Go in and explore the cool and raw design of the bar. They have 20 different beers on tap, all of them from small breweries around Denmark. Being Danish breweries, the names are full of humor. The last time I went I got a “the streets Beyoncé”, holding about 9.4%. I always order the funniest names and I’ve never been disappointed – funnily enough it’s always the ones with the highest alcohol percentage as well. They change the beer on a regular basis, so just when you feel you’ve tried them all, they present you with a new glorious row of golden liquid. The bar is centered around the essential – the draught bar. This divides the place into three places, where you can sit and enjoy one of the 20 beers on tap. Don’t cheat yourself out of the basement part, which is a bit away from the crowd. This is a well visited place, so there is always a line at the bar and a buzz all around. For the jocks, there are screens in every room, to show major sports events (in Denmark this mainly means football (or soccer if you’re American)). Drop in and get your golden drops. It’s worth it.